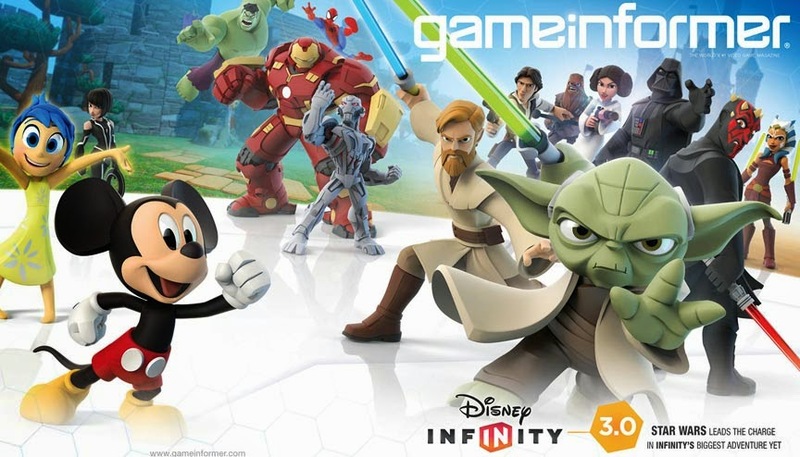 So soon after the leaked release of the Star Wars: The Clone Wars pack a week ago, Disney Infinity 3.0 has been officially announced through Game Informer. It makes sense to do it now, as "May the Fourth Be With You" was yesterday, although in truth I would've expected the announcement to arrive on the actual "Star Wars Day," May 25th. As already known, it will be heavily Star Wars themed (for all generations, old and new), with multiple Play Sets on the way including one to be released later in the winter based on The Force Awakens movie. What I find most profound is the way the game is being developed by many studios, each focusing on specific portions, aspects, or Play Sets . Avalanche is handling the main course, with others kind of specializing in certain areas or aspects. Ninja Theory’s playset will be the set with the game pack. It is called Twilight of the Republic, and will feature Anakin and Ahsoka at some point during the The Clone Wars series, attempting to find the person responsible for a new constructed droid army. It is said to contain both normal and space battles. Yoda, Obi-Wan, and Darth Maul have all been confirmed as separately purchasable characters. Studio Gobo’s set is called Rise Against the Empire that will roughly follow the main story of the classic trilogy. The set will jump around to key moments and places featured in the original films and feature the characters of Luke, Leia, and Darth Vader. Han Solo, Chewbacca, and Darth Vader have also been announced as additionally playable, but once again, a separate purchase is necessary. There will also be Avengers: Age of Ultron things for the Marvel players handled by United Front Games introducing Hulkbuster Suit Iron Man, Ultron, and a few more. And of course the Disney centric series will be getting a bunch of stuff as well such as Mickey, Minnie Mouse, Sam Flynn, Quorra, Mulan, Olaf, and more. And a nice new additional set will be based on Pixar's upcoming film Inside Out featuring a slew of the characters from the movie. Then lastly ,Sumo Digital has been brought on board to adjust and update the driving mechanics for an upcoming Kart Racing game, which will carry over into the Toy Box itself. Then speaking of the Toy Box, it is getting an overhaul with an updated hub world and a new farming system that will be added. I think one of the best announcements is that the DI: Power Discs will be sold in packs that you'll be able to see what you are buying now. No more blind luck to get things you are looking for. Disney Infinity 3.0 will be arriving on PS4, PS3, Xbox One, Xbox 360, PC, AndroidiOS, and the Wii U some time this fall. The Starter Pack is priced at $64.99.